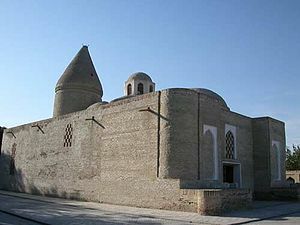 The Mausoleum Chashma-Ayub («The Source of Holy Iov») is situated not far from the gate Talipach, in the north-western part of Bukhara. It is one of the religious monuments of architecture, which includes mausoleum and "holly source", "chashma" means “well”. There is an inscription near the well, which says that the mausoleum was built in 1379-1380 by experienced masters from Khorezm. According to the legend the monument has the connection with prophet Iov (Ayub) who once travelled here during drought and helped local people dying of thirst. When he struck with his staff, there was a source of crystal-clear water, which remains clear and healing. There are also museum of water and exhibition of carpets in this mausoleum. If you visit this monument you have to drink water from this source as it’s known it has healing qualities.